The author of this oneshot is Tamura Ryuuhei. If you didn't know, he is the mangaka of the famous Beelzebub. 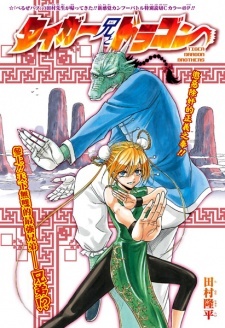 The story is about two brothers , Tiger and Bado, who climb a mountain to learn martial arts from an old sage. The plot is interesting. It definitely has a lot of potential if it gets serialised. As one would expect from this author, the comedy was hilarious. Moreover the art was great. The characters were very interesting. I highly suggest to check out this one-shott, especially for those who enjoyed this mangaka's previous work. Gonna be honest straight from the start. This is probably one of my favorite manga's i'v read. The thing is that this is just a one shot. It being a one shot is kind of sad to be honest. The comedy reminds me a ton of beelzebub( Probably has something to do with them both having the same creator) I honestly think this could go for longer then just 1 chapter. The characters surprisingly don't have any annoying ones. The two main ones are funny and interesting . Taiga is my personal favorite and i feel that it's meant to be that way. But one other character worth mentioning is the little sister that is always with them. She isn't annoying like i would expect from a sibling that is always around them. The artwork i find really good and also very entertaining to look at. It is also good at giving us good battle scenes. I in all honesty haven't enjoyed a manga like this sense beelzebub. I would love to see more of this. As the characters go throughout the country battling anything. I recommend you read this even if it doesn't sound like your cup of tea.